1) Find a template (any line drawing will do). Print out and tape onto pumpkin. 2) Poke holes with the end of a pin, or use the tools purchased with pumpkin carving set (like at WalMart). Make sure not to move or lift up the paper from the pumpkin until you are confident the holes are large enough to see, and all parts of the picture are traced. 3) Decide which portions you will cut away, and which you will leave as pumpkin skin to create your design. Using your carving tools, (I find they work best, and are safest for kids to handle), cut around the traced portions. 4) Remove pumpkin skin and enough of the part underneath so light from a candle or battery-operated light will shine through. 1) Carve your pumpkin as close to Halloween as possible. Day prior, and day of is best. 2) If possible, keep your pumpkin wrapped in a plastic bag, and stored in the refrigerator. You can also store pumpkin in a cooler with ice. Just make sure to put plastic, and a towel between the ice and pumpkin. 3) I've tried all the other suggestions of spraying/dunking in a bleach solution to reduce mold growth, but I've found they don't really work well. And your pumpkin becomes shrivled. 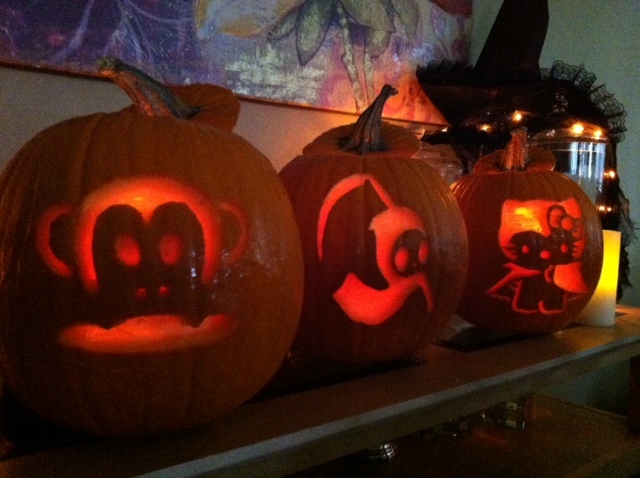 I was going through Ellen's website--checking out the pumpkin carving photos...and saw the one (I had forgotten that I sent) we did last year! Germs...Is your purse, phone, grocery cart making you sick? Are you a germaphobe? I have to admit that I am. I always have antibacterial wipes and gel on hand--and I use them liberally...everywhere. I never use the community pen at a store, and I clean my hands immediately after using those magnetic signing pens. I try not to touch door knobs, elevator buttons, and I never hold the railing on a stair or escalator. 1) Your purse may carry A LOT of germs both on the inside, and outside. Never put it on the floor of the bathroom (e coli...ick! ), on the restroom sink, back of toilet, or anywhere you prepare food or eat (no counters or tables). Don't put it on the restaurant floor, and try to hang up your purse when you can. Make sure to wipe it down with a cleaner and clean both the inside and outside frequently. Tests have found over 1,000 germs on women's purses! Oh yeah, also think about where your purse goes--your car seat, desk, table, bed, home floor. Now I have a set place my purse sits. And I set it down on something too. 3) Over 25% of cell phones have e coli bacteria on them. Ewww! So think about where you place your phone (restaurant table, sink area, desk, etc. )...and clean your phone often. You will think of this, (wonder where their phone has been), the next time you borrow someone's phone. After buying your food, they put them in grocery bags (or your reusable bag--see earlier post about this too)...then you put the bag back in the dirty cart. It then goes in your trunk, and to your home. Remember this when you put your grocery bags down. Think about where it has been. Ewww! Randy Pausch quotes and life lessons...if you are having a bad day, you need to read this! After you watch "The Last Lecture," take another hour to watch this ABC News Special with Diane Sawyer. You'll learn more about Randy Pausch, his wife Jai, his family and what happened after the lecture...how "The Last Lecture" changed people's lives. If you ever feel like you're having a bad day, week, month, year...watch this video and in just one hour, you will feel better, appreciate all that you have. Appreciate life. Someone introduced me to "The Last Lecture" about four years ago, and if you haven't seen this inspirational "lecture," I highly recommend you take an hour to watch it. If you have seen this video before, like any great piece of work...it's worthy of another view. 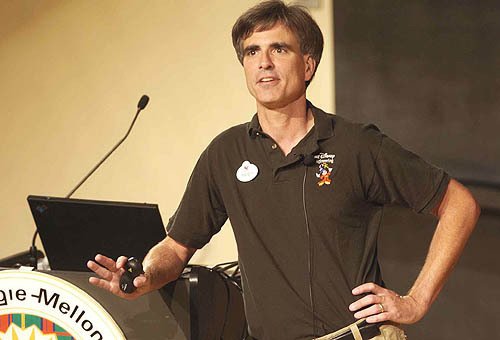 Randy Pausch was a computer science and human computer interaction and design professor at Carnegie Mellon University. "The Last Lecture" was an annual event at Carnegie Mellon, which professors would contemplate if they were given only 6 months to live, what would you say, what would you do, how would you live that life? Unfortunately, for Randy, this was his reality, as he was diagnosed with terminal pancreatic cancer and was given 3-6 months of good health to live. His lecture was captured on video and downloaded over 15 Millions times since then.